""Have you heard of the Oblique Road?" she asked. "I think it's just another legend. A line that crosses the entire Company and leads towards another place, one that's not buried under the ice, but a place where it's possible to live outside, without relying on rails and trains... I don't believe in it." The Ice Company series is the sprawling saga of a future Earth in a new Ice Age. Mankind lives in domed cities, connected by extended rail networks, controlled by powerful companies which effectively rule the world. This new Ice Age was created when the Moon exploded and the resulting debris blocked all of the Sun's light. Civilization collapsed, and after several centuries of barbarism, the age of the Ice Companies eventually arose. For its scope, complexity, ambition and craftsmanship, The Ice Company ranks with such science fiction masterpieces as Foundation and Dune. 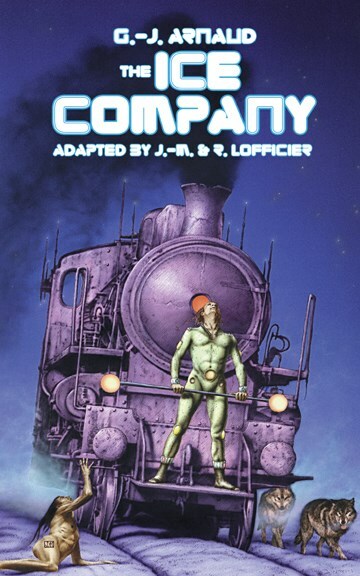 It was first published in 1980 and won the 1982 French Science Fiction Grand Prize and the 1988 Apollo Award. This edition includes a bibliography of the series and detailed summaries of the first 34 volumes.